Once you’re a member of Interactie, you’re also an ESTIEMer. This means you can join all the events that are organised within ESTIEM. The 76 “Local Groups” from all over Europe can organise events with different themes. There are events that show you the cultural, political and economical dimensions of a country(Europe3D), conferences and events that focus on a relevant topic in the Industrial Engineering field or Activity Weeks with certain themes. 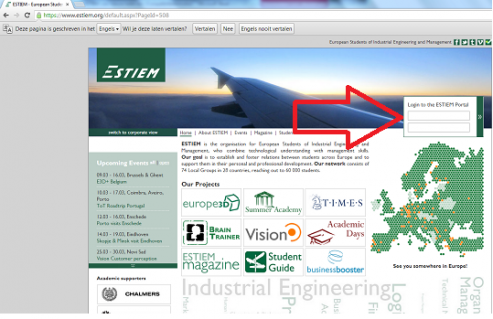 You can find all the offered events and more on the ESTIEM website, the so-called Portal. On this page you find a small manual to find you way on the Portal. When you come on the Portal, you can immediately log in. 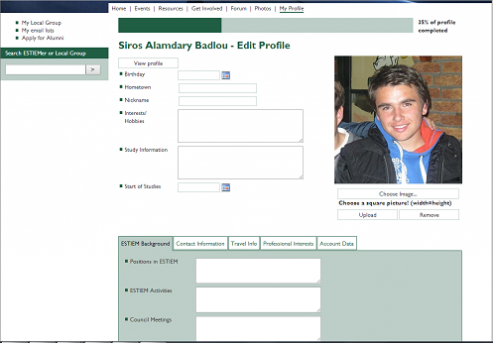 Your user name is your full name and you can fill in your password through the mail you received once you’re registered in ESTIEM. When you’re logged in, you see the following screen. In the left green block you see three events with the nearest application deadline. In the green block on the right you see the forum topics that are most current. You also see the tabs: Home, Events, Get involved, Forum, Photos and My Profile. Sometimes it is quite hard to find something within the ESTIEM site, because the structure is not always that convenient. If it is your first time on the Portal, it is recommendable to update your profile. When you click “My Profile”, you see the following screen(with your own account of course). It is quite self-evident how to adjust all your data and how to upload a phote. It is really recommended to upload a picture, because it looks nice and it increases your chances to be accepted for events. When someone looks on your profile, he sees all the events you’ve ever visited and the details you have filled in. Now you have updated your profile, you can apply for an event. When you click on the tab “Events”, you can see all the events that are available. In green letters you see the type of event, the theme/topic, and the location. In the black letters you see the date of the events and whether you can still apply fo the event. The first events have often already passed the application deadline. On the right you could use filters to find specific events and all the way down on the page you could navigate to the next page. When you’re interested in an event, you can click on the block to get more information. You’ll see you can’t click on every block, because you can’t apply for events like Local Group Exchanges. When you for example click on “ Ice Hockey World Championship Activity week” in Minsk, you see the following. 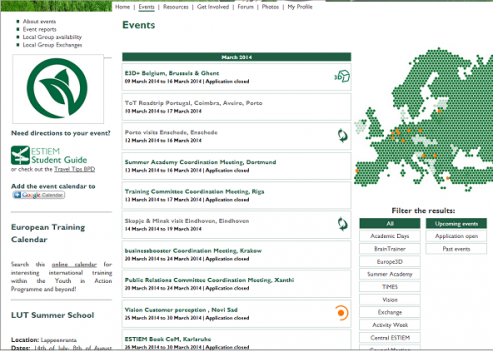 In the green block you see the location, dates, the application period(application deadline of the example is March 28 for example, the participation fee(that can be declared at Interactie), the amount of persons that will be accepted for the events and the cancellation deadline, the last date that you can cancel an event once you’re registered without possible financial consequences. When you click “Apply for event”, you have to write a short motivation of 500 characters. Write this motivation with some enthusiasm, to convince the organisers you are really motivated to attend the event. Once you’ve applied, you get a confirmation mail from ESTIEM. From that moment on, you have to wait until the organisers accept you for the event. This can take a while after the application period. You get an e-mail if you’re accepted. Once you’re accepted and registered for an event, you can still cancel. Do this before the cancellation deadline. You can also click on “Show Participants”, to see who else has applied and is accepted. On the portable you can also see the possibilities what is happening within Central ESTIEM. 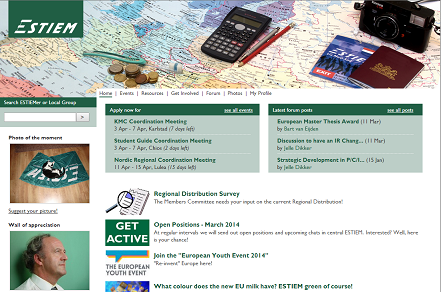 Under the tab “Get involved”, you find the different projects and committees that you can join within ESTIEM. Also, if you want to stay updated about ESTIEM, you can join the active maillist.